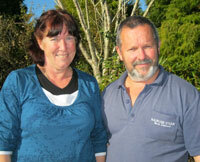 We have both lived in Waitakere city all our lives and on our farm for the past 12 years. We are passionate about our New Zealand Heritage and enjoy showing people what and how things worked in days gone by. Our love of heritage went far beyond just machinery. We became interested in our heritage breed chickens in New Zealand and other animals which came over with settlers in earlier times. My family originally came over from Wales and Ireland in 1840 and, through genealogy, I got interested in how they managed when they got to New Zealand. This led to Gary and I belonging to many Vintage Clubs, Historical societies and establishing close contacts with MOTAT. We now go to shows all over New Zealand for Vintage Machinery, Steam and Poultry. We have a sustainable farm and have heritage trees which were already here when we moved in - our home is 100 years old. The bees are a lovely addition to our farm and as a species are in need of protection from all the nasties out there. We have some lovely aparies on the farm and the bees seem to be liking it because the honey was great this year. We belong to the Auckland Bee Keeping club and enjoy our meetings and information sharing with other members. It seems that birds and bees go together somehow. We have 25 New Zealand Rare Breed Poultry on our farm and we're proud of every single one of them and the blood lines we've built up. We are more than happy to assist people with setting up their own flock of backyard chickens. We can supply the chickens, the coops and loads of expert advice. We hope you enjoy our web site and information on Heritage Farm. With prior arrangement we welcome visitors to our farm to reminisce on days gone by and enjoy a day out with the animals. Please note that visitors to the farm need to take care as there is machinery and livestock. This is especially important when bring children out to Heritage Farm. © 2010 Heritage Farm | Heritage Breed Poultry, Bees and Vintage Machinery.